With Thanksgiving around the corner, the holiday season will be here soon! 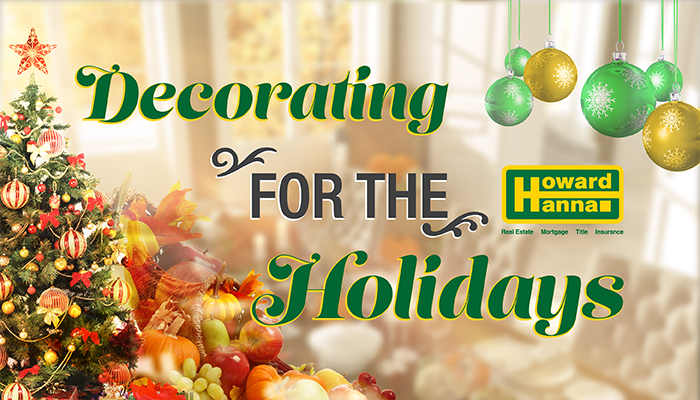 Decorating your home can be a fun and exciting time that gets everyone in the mood for the holidays. We’ve created some fun ideas and tips to help make your home ready for the festive season! The holidays bring people together to celebrate. Decorate family spaces in your home to keep the holiday spirit abundant. Wrap stair rails in ribbons, garlands, and lights. Adding ornaments such as bulbs or dreidels can bring in even more spirit. If you have an entryway table, add greenery with sprigs of branches, flowers, or any wintery plant. This is a great way to make your home more cheerful on cold winter nights. If the table is close to a window, this would be a perfect spot to place a menorah or other decorations. Living rooms and family rooms are a great place to showcase family holiday heirlooms and favored decorations. Hang holiday cards or paper stars on the walls or over doorways. Tuck Hanukkah crackers or small, wrapped gifts into corners or onto side tables for a search-and-find game for children. Add holiday throw pillows or wrap existing pillows in holiday fabric for a comfortable decoration. Candles with wintry scents will bring the feel of winter without the chill. Fireplace mantels are a great place to put decorations, as they are usually the focal point of the room. Place garlands and candles on your mantel for a simple yet elegant look. Hang stockings with care off the mantel by using either stocking holders or a curtain rod. You can also string a gelt garland to hang off the mantel. Use the mantle to show off a Nativity scene or collection of figurines. One of the best things about the holidays are the meals, making the dining room an important spot. Deck out chairs with burlap and ribbons for instant holiday cheer. The table runner can match the chair covers or use a fun, patterned fabric. Centerpieces can be a range of things. Fill vases with holidays fruits like oranges and pears or place plants and greenery. Add candelabras for an elegant effect or simple tea lights for a quaint feel. Decorations aren’t just for indoors, so while the weather is still nice, put up the outdoor decor! String lights and garland together over an entry way for a warm welcome. Hang wreaths on windows and highlight them with spotlights. Weave ribbon through porch railings for an eye-catching detail. Add colored lights for a surprising look or keep it simple with white lighting. Consider tying all outdoor decorations together with a color theme of your choice. The holidays are a wonderful time full of happiness and love. Decorating your home can bring excitement to this special time of year. Spend time with your family and friends, and enjoy the holidays together.